Large projects can be split into smaller parts using submodules. A submodule contains the name, url and revision of another repository. 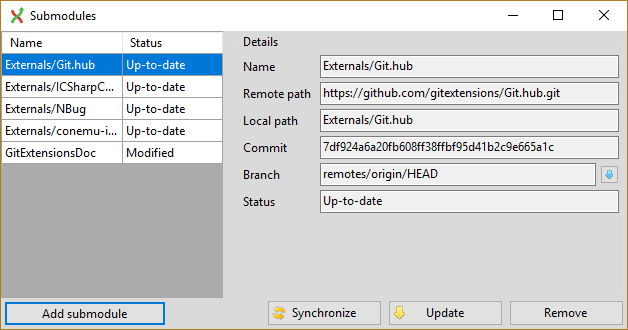 To create a submodule in an existing git repository you need to add a link to another repository containing the files of the submodule. The current state of the submodules can be viewed with the Manage submodules function. All submodules are shown in the list on the left. Synchronize Synchronizes the remote URL configuration setting to the value specified in .gitmodules for the selected submodule. Initialize Initialize the selected submodules, i.e. register each submodule name and url found in .gitmodules into .git/config. The submodule will also be updated. Update Update the registered submodules, i.e. clone missing submodules and checkout the commit specified in the index of the containing repository. 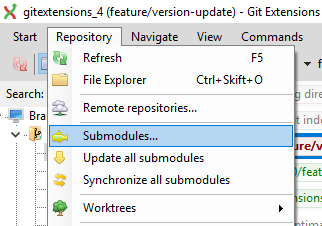 To add a new submodule choose Add submodule in the Manage submodules dialog. Path to submodule Path to the remote repository to use as submodule. Local path Local path to this submodule, relative to the root of the current repository.